My parents brought all the adults out to dinner on Wednesday for their Anniversary. 48 years! How lucky are we? We went to Chinato on E.4th and Prospect. 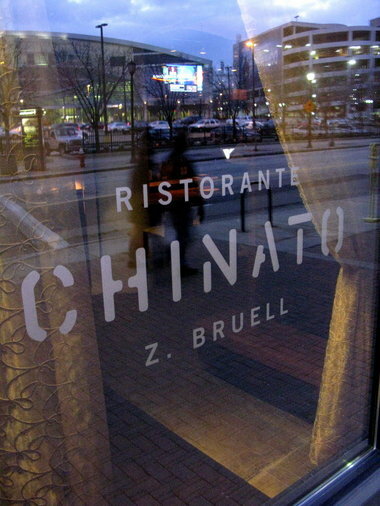 Chinato is Zac Bruell’s newest restaurant that opened earlier this year. We love all of his restaurants: Parallax, Table 45, L’Albatros, and Chinato. It’s hard to decide which is my favorite as they are all so different and each of them are awesome in their own way. We started out with cocktails, wine and beer and ordered 4 different appetizers to pass around: scallops crudo, fried artichoke leaves, mussels with wine and fennel, and eggplant involtini stuffed with shrimp. We then split a few order of gnocchi which were tender as can be in a butter and garlic sauce. mmm mmm. Everyone ordered their own entree. I had porchetta which was pork belly wrapped around braised pork shoulder over greens. Awesome. Courtney has braised beef served over polenta and greens. Everything was excellent. For dessert we ordered 5 different desserts and passed them around. Lemon cornmeal cake with lemon ice cream, chocolate mousse cake, panna cotta, tiramisu, and the gelato sampler which was chocolate, vanilla and cherry. My pick for the winner was the lemon cornmeal cake – which I just found a promising recipe that I will try – but everything was great.